Published on Thursday, November 9, 2017. This article appears in the October/November 2017 issue of American Craft Magazine. The hot-sculpted Water Bags series explores the physical properties of glass and water alike. Ask Dylan Martinez about his childhood in Minnesota and he’ll speak fondly of camping, fishing, playing sports, and helping his father, a mason, build structures for high-end homes. Ask the 31-year-old about art, though, and he’ll admit it’s a relatively new passion – and one closely connected to his love of scientific discovery. In 2008, Martinez graduated from the University of Wisconsin-River Falls with a degree in science, because he’s always been interested in how things work. But one day in his junior year, he happened to wander past the glassblowing studio. 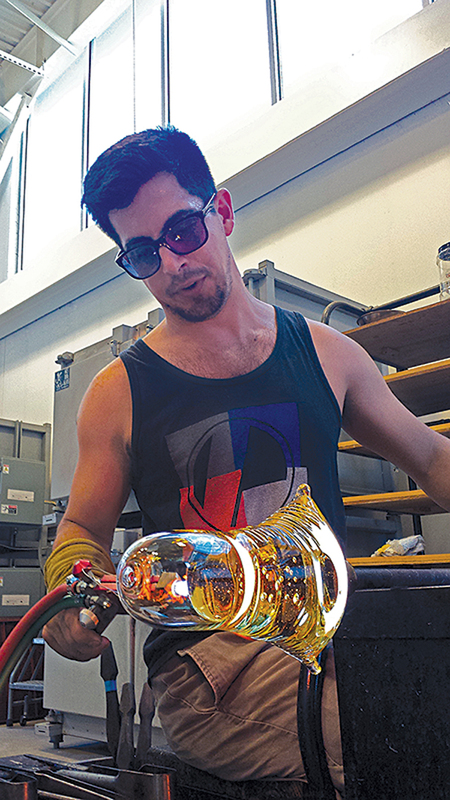 “I was really struck by the process and all the equipment and the heat that it took to shape [glass],” he says. “So I tried it out, and it really resonated with me, both in the way that you move the material and how it seemed to react to a lot of the physical forces that I’d been studying in physics and chemistry and geology.” He’s been studying it ever since. Take, for example, his Water Bags, a recent series of sculptures that are both hollow and solid, complete with rising bubbles and creases so accurately folded that the forms could easily be mistaken for the real thing. The works combine delicate goblet-making techniques with methods that render the bag’s heavy, “super-solid” bases. 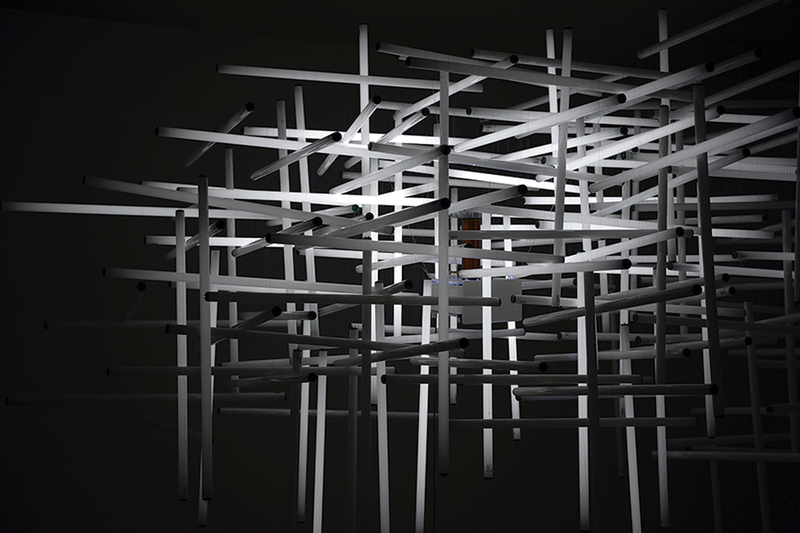 Or look at Inverted Logic (2017), an installation that juxtaposes camera lenses and photo enlargers against grids of black lines to explore perception. Cumulonimbus (2017), built from fluorescent tubes and a Tesla coil, is a representation of the dramatic weight of storm clouds. Entry point: Although a lot of his work tackles complex subjects, Martinez isn’t a big fan of highly conceptual art, which he thinks can turn people away. “If you don’t understand art history or the foundations of art, it’s hard to grasp what someone’s talking about,” he says. Give and take: Martinez loves teaching others the tricks he’s learned in the studio. The more people share – both as artists and as members of a global community – the more everyone grows, he says. H2O/SiO2 2016, glass, 16 x 7 x 4 in. 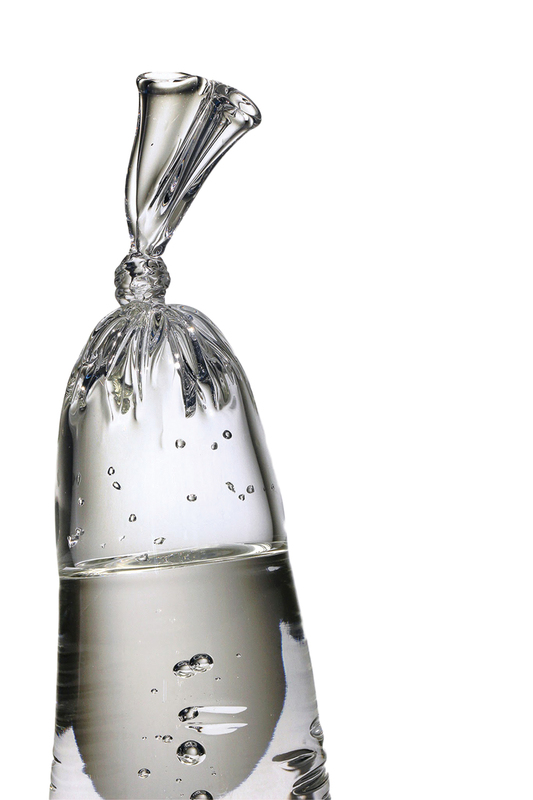 (tallest) The hot-sculpted Water Bags series explores the physical properties of glass and water alike. Cumulonimbus, 2017, Tesla coil, fluorescent tubes, monofilament, 16 x 14 x 12 ft. Powered by a Tesla coil, the suspended “storm cloud” – composed of 175 4-foot fluorescent tubes – flickers on and off with a loud buzz. 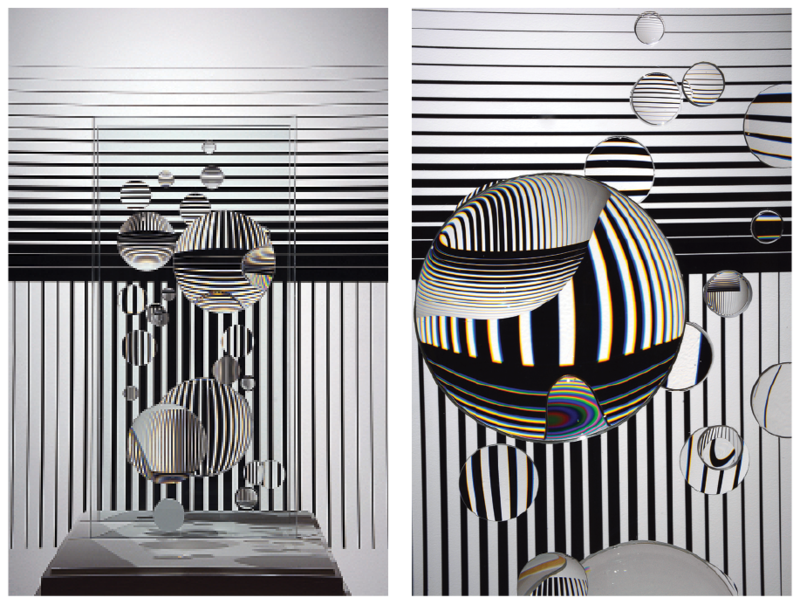 Inverted Logic (installation view, detail), 2017, camera lenses, float glass, vinyl, 4 x 4 ft. Because the optics of Inverted Logic are affected by the viewer’s position and movement, the work is always in flux.